The EuroCave Standard Pack allows for additional convenience and flexibility of your EuroCave wine cellar. It includes 6 rolling shelves* for additional storage and easy access. The replacement charcoal filter ensures natural ventilation and humidity control in your wine cellar. It is recommended that charcoal filters are replaced every year for optimal performance. The EuroCave Standard Pack allows for additional convenience and flexibility of your EuroCave wine cellar. It includes 6 rolling shelves* for additional storage and easy access. 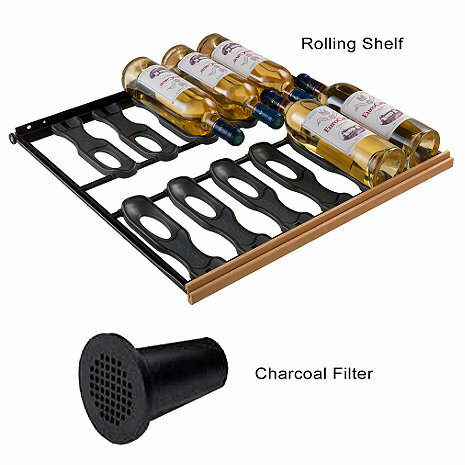 The replacement charcoal filter ensures natural ventilation and humidity control in your wine cellar. It is recommended that charcoal filters are replaced every year for optimal performance. Installation of each shelf requires two included brackets, no tools required. Each rolling shelf holds 12 bottles** of wine. These are for the EuroCave Performance (excluding Built-In), Comfort, Digital Comfort, Elite and Premier series.